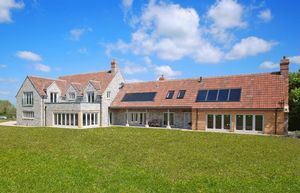 Glastonbury 5 miles, Street Village 4 miles, Castle Cary Railway Station (London Mainline) 10 miles, Wells 10 miles, Bristol Airport 27 miles & Bath 32 miles. 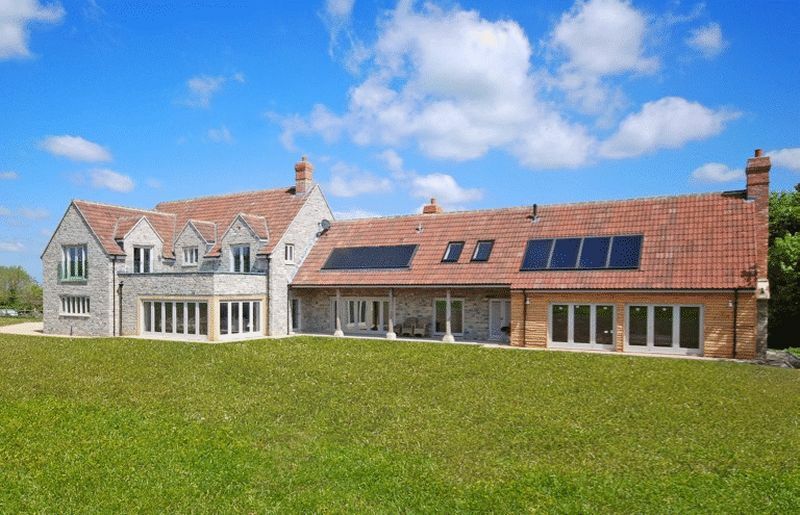 Well House is a striking new built country house sitting in 8 acres of idyllic Somerset countryside in a very convenient location. It has been constructed using reclaimed period materials wherever possible and sympathetic heritage approved materials elsewhere. 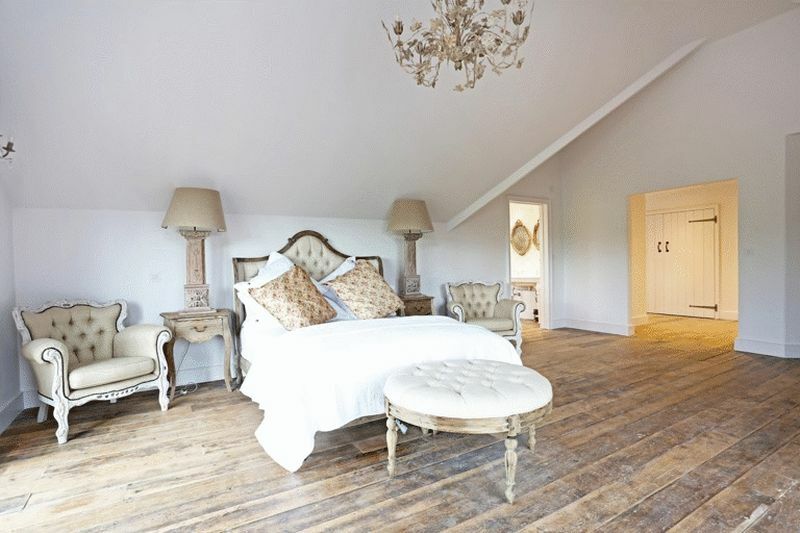 In this property the new owners will quite simply have the best of all worlds. The authentic look and feel of antique materials and craftsmanship have been lovingly combined with all the comfort, low maintenance and low cost of ultra-modern building technology and energy efficiency. The house has literally just been completed and it's ready to welcome its first owner. The property has been specifically designed by a well-known local husband and wife development team to operate as a welcoming and sociable family home with natural flow from one area to the next. Set away from the main road in a quiet and peaceful rural location the house boasts 5/6 very generously apportioned bedrooms (4 en-suite), an equal number of principal rooms on the ground floor and a self-contained one- bedroom guest cottage of similar quality in the grounds for guests or staff. 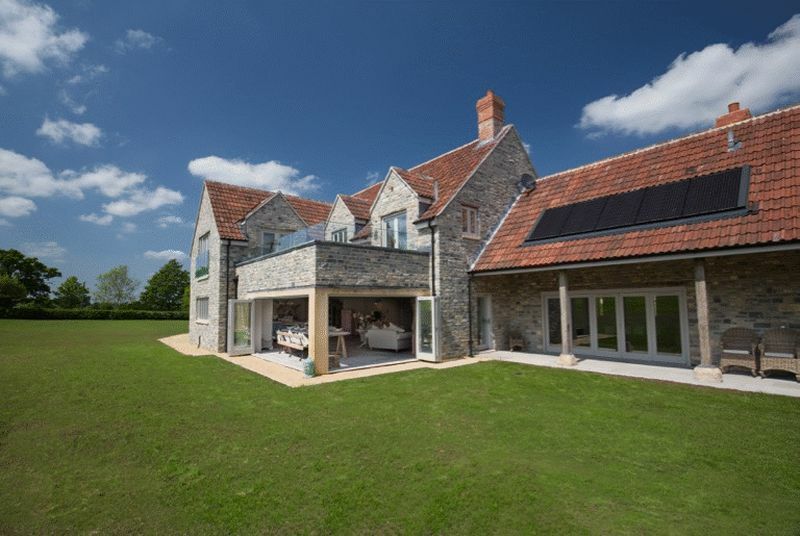 Well House has been thoughtfully designed throughout to be flooded with light from its south facing aspect. 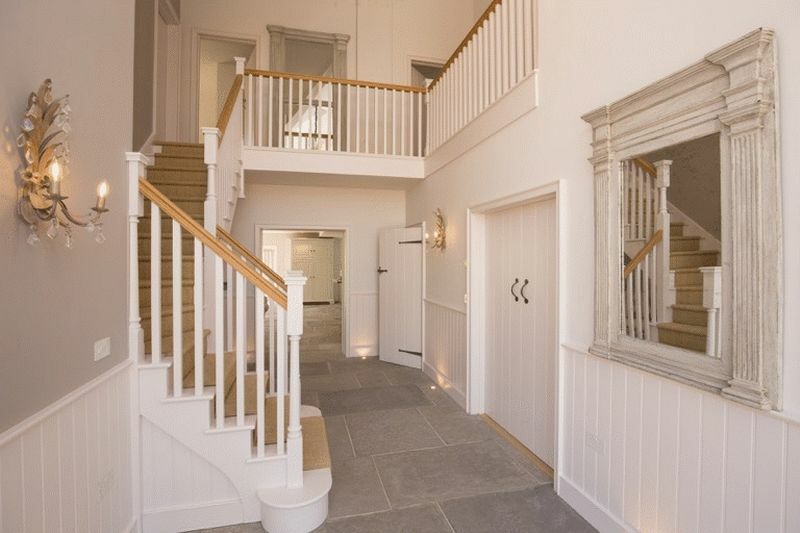 The entrance hall is truly magnificent and the carefully placed windows make the very best of the natural light to show off the heritage approved flagstones, carved staircase and galleried landing. No expense has been spared in the materials used or attention to detail to achieve the impressive finish across 5,000 square feet of accommodation. 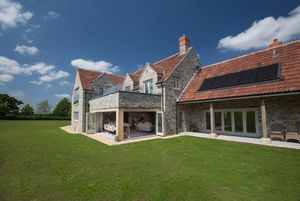 The house is constructed from reclaimed stone over 200 years old and is double-glazed throughout, has mains gas central heating with underfloor heating throughout the ground floor. There is a novel and eco- friendly electric Aga oven powered by solar panels, solar powered hot water, an integrated concealed music system in every room, hi-strength wi-fi capabilities for every room, reclaimed Victorian floorboards in the master bedroom, a games room, utility room, two folding double glazed walls which open up from the kitchen and games room on to the ample gardens and four open and fully operational fireplaces for those cold winter evenings. 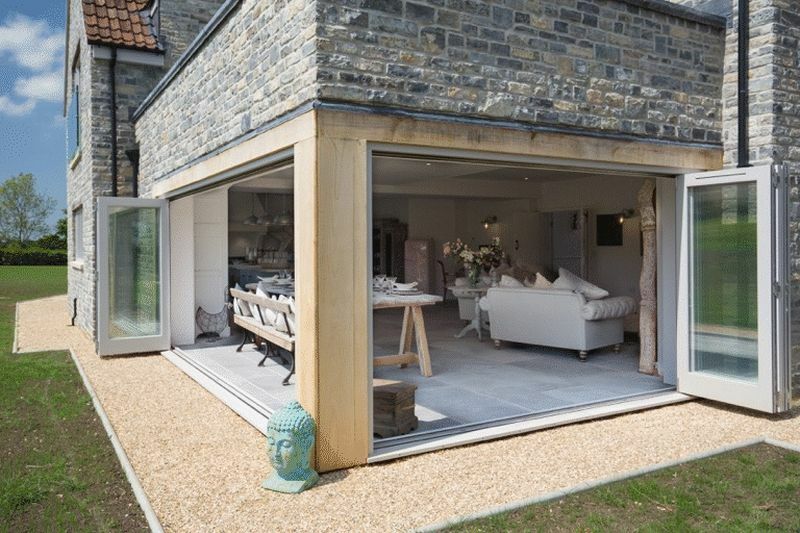 The juxtaposition of old and new in this property is very tastefully done and works particularly well. A particularly impressive feature is the large open plan Kitchen Family Room (40 x 30 feet) which creates a beautiful space for family meals or informal entertaining. Flagged throughout, there is a dining area placed next to the full height folding windows and a cosy seating area around the open fire. 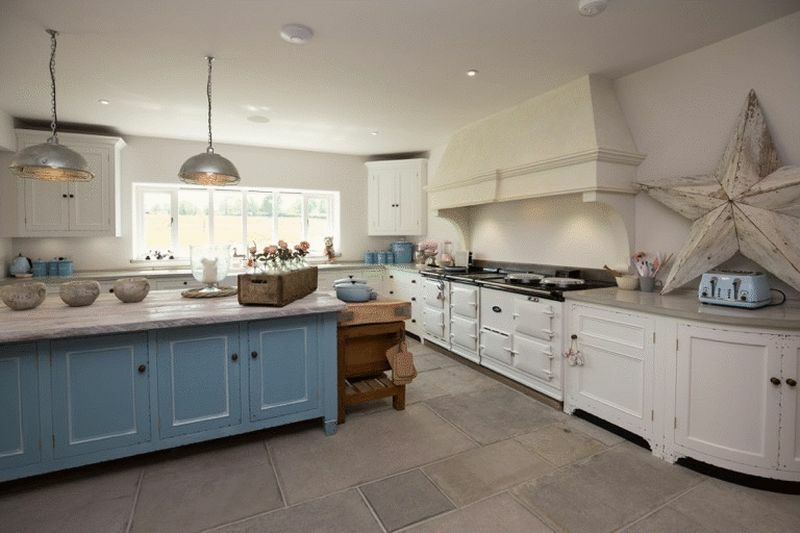 The kitchen units themselves were built by local artisans in a similar style to Chalon. The food preparation areas are an interesting combination of polished concrete and aged timber. These compliment the double Belfast sink and Aga range perfectly. 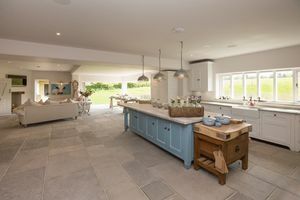 Again, the kitchen has been designed with the serious ‘foodie’ and busy family equally in mind. 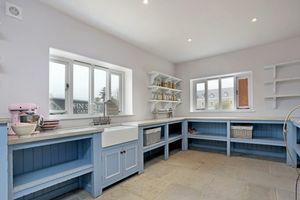 A flagged utility room flows conveniently from the kitchen with all the appliances one would expect (matching commercial Samsung washing machine, tumble dryer and ‘upright larder’ fridge freezer). Double doors lead from the kitchen to the Music Room and again from here through a further set of double doors to the Drawing Room. Here there is an inviting large open fire and a double aspect with generous south facing sliding doors opening on to the gardens. 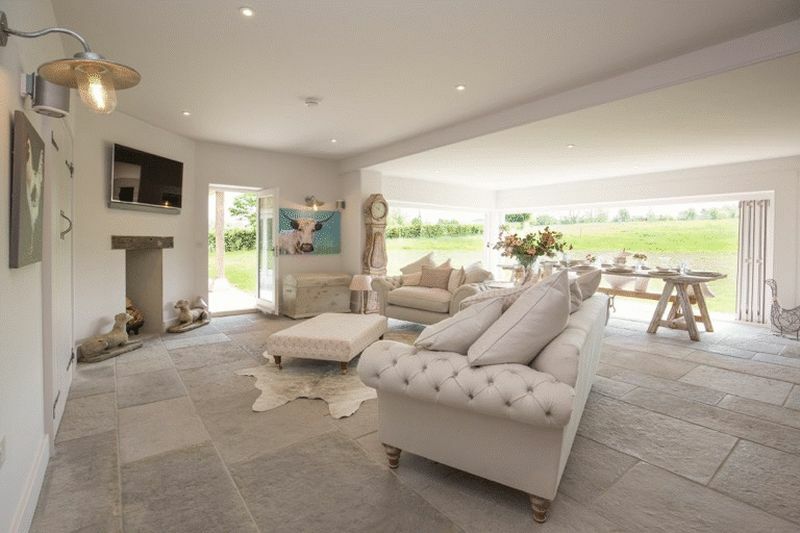 A perfect space for formal and informal entertaining or simply relaxing in front of the fire. A very thoughtful covered walkway has been incorporated in to the design of the house. 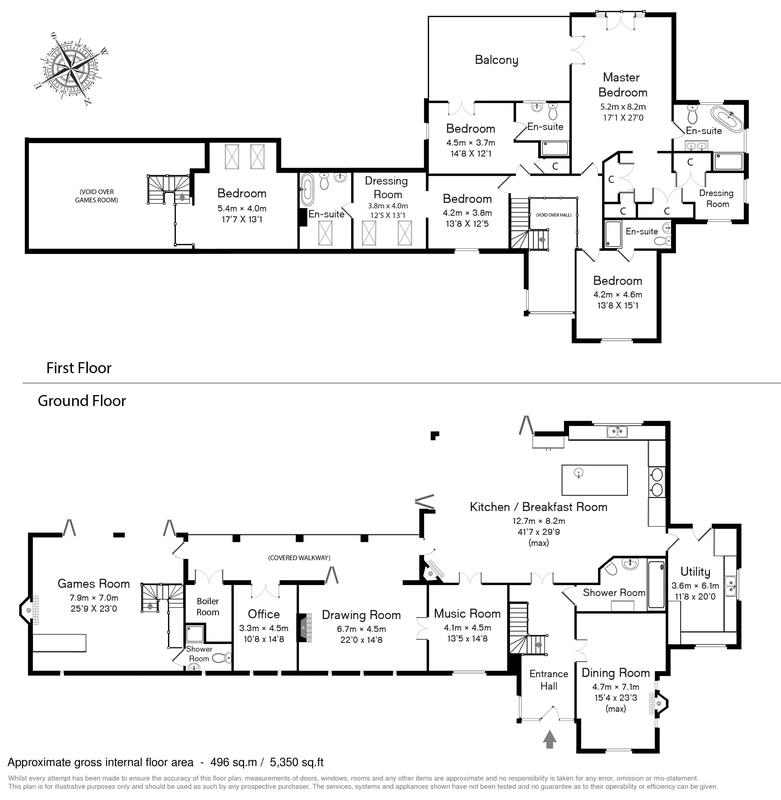 This links the main body of the house with the Study/Office and the Games Room which runs east to west along with rear of the house. This provides physical separation for people using the Study/Office for quiet time or indeed the children using the Games Room. The walkway itself is supported by three reclaimed 200 year old timbers sitting on equally old hand carved stone plinths. 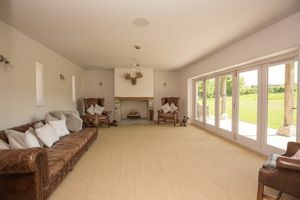 The Games Room is at the farthest extent away from the main body of the house to provide peace and quiet. The ceiling of the Games Room opens up in to apex of the roof to provide maximum light and space. 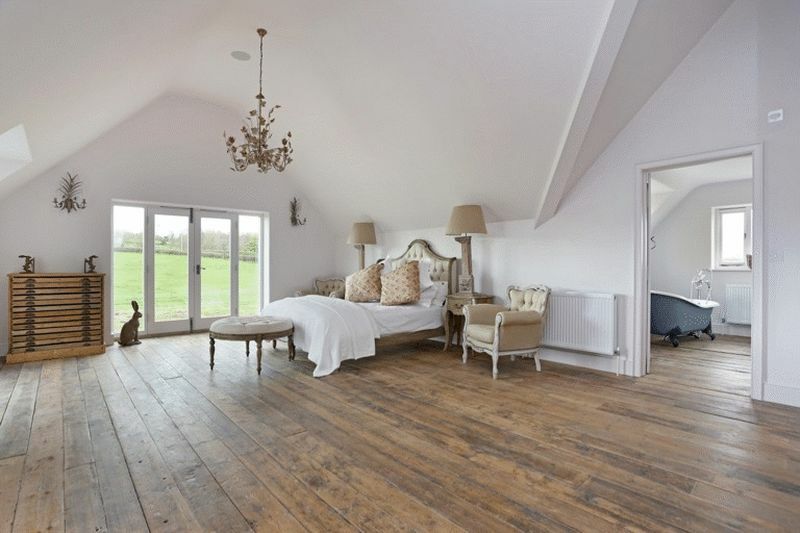 This room has full height sliding glazed wall opening up on to the grounds, a large open fireplace and a private staircase to a large first floor guest bedroom. The beautifully lit carved and paneled staircase opens up on to a galleried landing which links the first floor seamlessly in to the flow of the building. 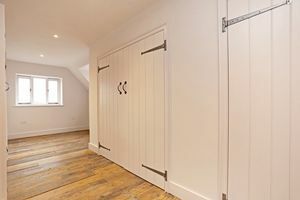 Five of the bedrooms flow off the galleried landing with the sixth guest bedroom accessed privately from the Games Room. The Master Bedroom is finished with reclaimed Victorian flooring and has double glazed doors which open up on to a first floor balcony which has stunning views over the countryside. The en-suite bathroom has been finished with an impressive claw foot double bath and double rainmaker shower. 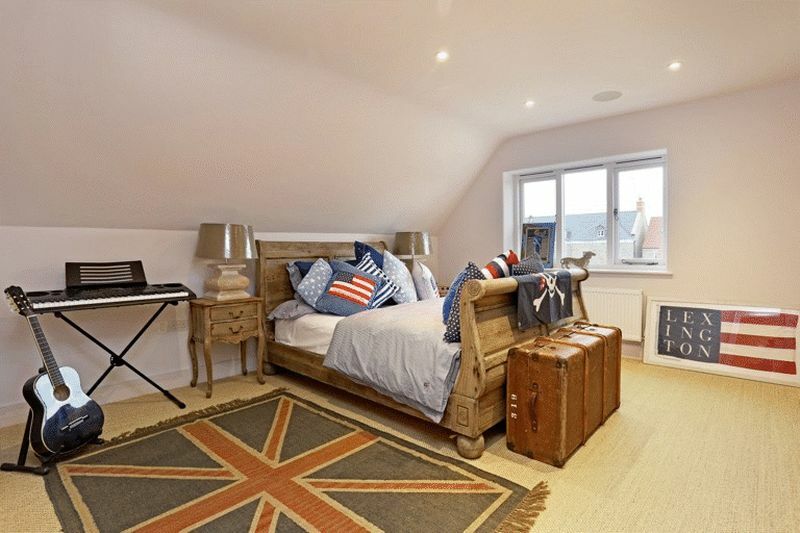 The remaining bedrooms are finished to a similarly high standard. 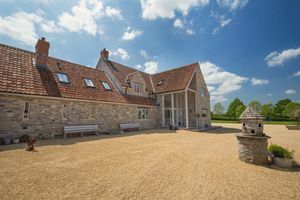 The grounds of Well house extend to 8 acres of typical Somerset meadows and gardens providing plenty of space for an Equestrian area and tennis court if desired. The area immediately adjoining the property has been very simply landscaped with new lawn intentionally to provide a simple blank canvass for the new owners to put their personal stamp on. 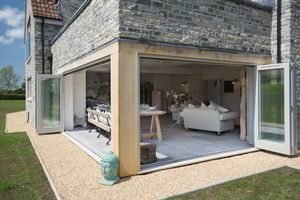 There is a generous timber built double garage very conveniently extending from the main house providing covered parking. There is also plenty of space otherwise on the long sweeping gravel drive at the front and side of the property for multiple parking. Well House could not be better placed for country living with easy access to local towns and main line train stations. A very popular and welcoming local Pub called The Rose & Portcullis is just three minutes walk away from the house. The pub has a very good reputation as a family friendly establishment serving high quality locally sourced food. Well House is on the outskirts of the popular village of Butleigh which is one of the most sought after residential areas in the county. The village of Butleigh has a vibrant community with local shops, more pubs and restaurants, cricket club, rugby team and primary school. 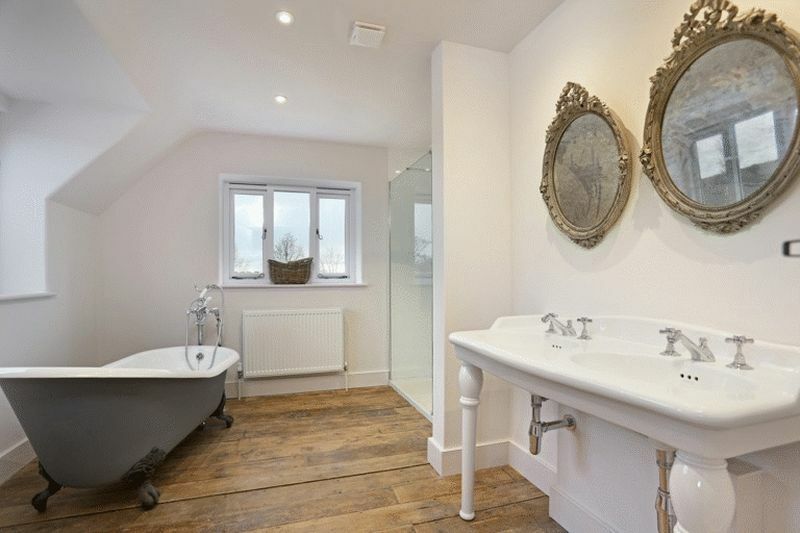 Street, Glastonbury and Wells are also on your doorstep whilst Bath and Yeovil are in easy driving distance. Castle Cary Train Station is 10 miles away from the house and is on the mainline to London Paddington. 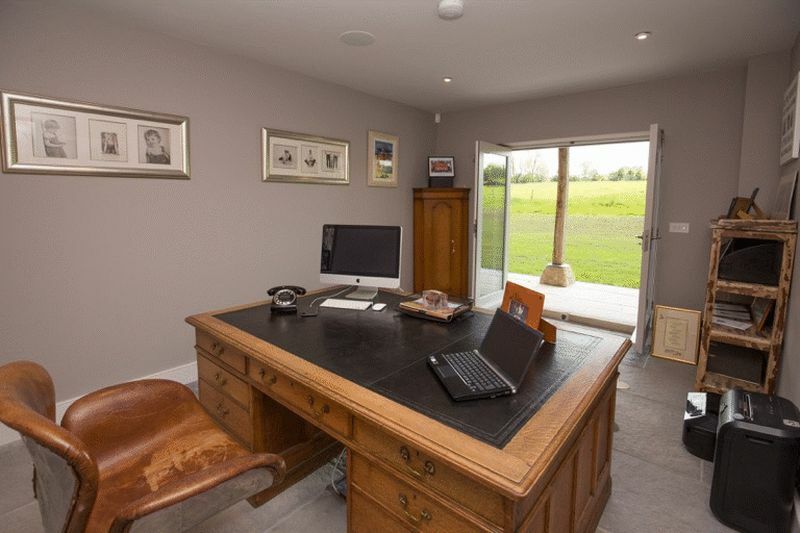 This puts the new owner within easy commuting distance of London. The local area is home to some of the very best schools in the country. 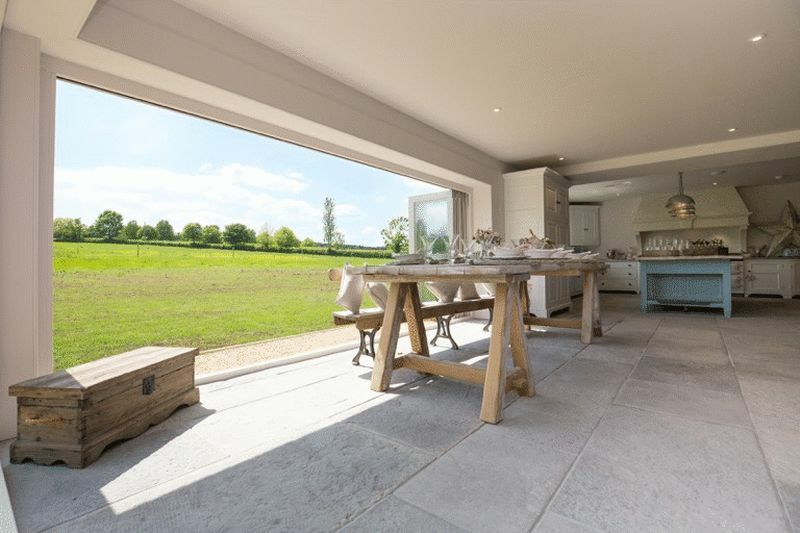 Millfield, Wells Cathedral School, Downside, All Hallows and the Kings Bruton schools are all on your doorstep. 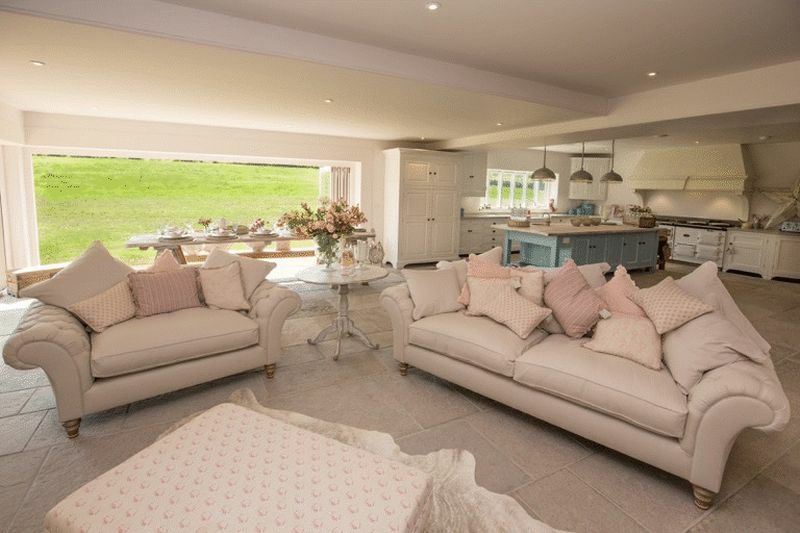 We are proud to be representing a rare property like Well House for sale. The superlatives come thick and fast when describing this house but, the truth is, Well House will sell itself upon viewing. We would be delighted to guide you round the house so you can see for yourself what it has to offer. Post Code BA6 8TF From the west - take the A39 towards Street village. Keep on the bypass past Sainsbury’s supermarket. At the next roundabout turn right, across the next roundabout and at the traffic lights turn left past Millfield School. Stay on this road, to Butleigh, pass the Rose and Portcullis pub and take the next left. Well House is on the right hand side set back from the road. From the east - take the A303 to Podimore Roundabout and take the A37 north. Take the first left off the A37 signposted Charlton Adam. At the mini roundabout take the right fork to Charlton Adam. Continue on this road, through the village and continue to a crossroad. Turn right and immediately turn left. Take the 3rd right signposted Butleigh. Take the 2nd right and Well House is on the right hand side.